ExcaVision is available worldwide, and supports 13 languages! 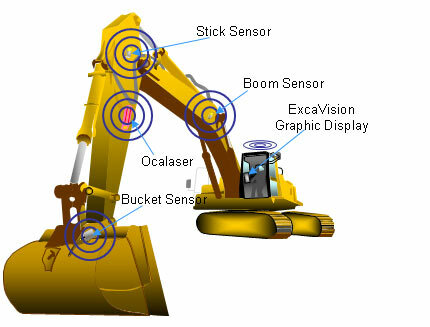 ExcaVision is a grade control system for excavators and backhoes. It consists of a touch screen graphics display, three angle sensors, and a receiver box. The standard system is wireless, cabled versions are also available for underwater work. The operator does not need an assistant, resulting in lower wage costs. No need to redo jobs because of inaccurate excavating ("overcuts" and "undercuts"). Reduced material cost and transport costs. Reduced risk of damaging electrical, gas and sewage lines. Operator is more productive and does not risk accidents by measuring outside. Surveyor (helper) not needed in or near excavation. Reduces risk of electrical shock due to ruptured electrical cables. The screen can display the menus in many languages, such as English, Spanish, German, French, etc. Keep working longer. Less light needed for perfect work. Dig to exact grade in ponds, rivers, harbors or other water filled excavations. The bottom line: More PRODUCTIVE excavator operation. 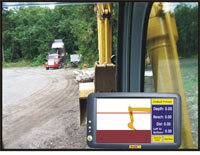 The Depth Monitor installs on any excavator in less than an hour.